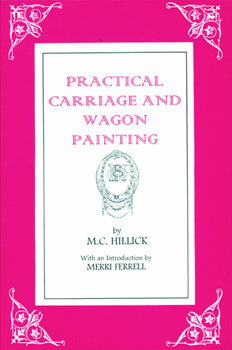 Today's collectors who seek instruction on painting and decorating their horse-drawn vehicles can do no better than this reprint of a book originally published in 1898. The author was one of the best-known carriage painters in the country and was described in the Preface as having "the happy faculty of being able to impart his knowledge to others in such a plain, practical way that they cannot fail to understand him." You will find here information on the buying, care, and use of brushes; colours; varnishing; striping; scroll painting; lettering; monograms; repainting and revarnishing; painting cutters and sleighs....and much more. The book is full of beautiful ornaments; there are scrolls, borders, corner pieces, acanthus leaves, and imaginative lettering--all of great help to restorationists, as well as being a source of inspiration to graphic artists, conservators, and museum professionals.